(This jersey is as soft as Big Foot’s belly. 150cm / 60" wide. 96% Poly, 4% Lycra. 1 mtr = 1 unit. Find your own weird and wonderful :). 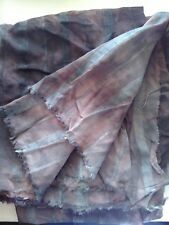 Length of brown tie dye viscose with repeating stripes across fabric. Dark blue tie dye. Striped pattern - alternate wide and narrow - repeat is 8 cm. 145 cm wide. 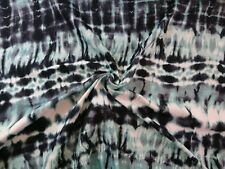 Weight - 500 g.
Length of blue tie dye viscose with repeating stripes across fabric. Dark blue tie dye. Striped pattern - alternate wide and narrow - repeat is 8 cm. 145 cm wide. Weight - 800 g.
(This jersey is as soft as Big Foot’s belly. 150cm / 60" wide. 96% Poly, 4% Lycra. Find your own weird and wonderful :). 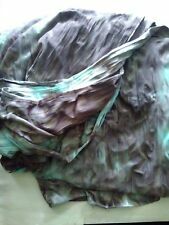 Check brown/ turquoise tie dye effect - fabric is stretchy. Length of polyester fabric suitable for furnishing and other craft work. Colour: GreenMaterial: 100% SilkWidth: 60"
Colour: BlueMaterial: 100% SilkWidth: 60"